Experts say it’s not a matter of if, but when a global scale pandemic will wipe out millions of people. And we are grossly unprepared for the next major outbreak. But in the event of a devastating pandemic—whether it be triggered by a mutated strain of an existing virus or a bioengineered terror weapon—there are some practical things you can do, both before and during the outbreak, to increase your odds of survival. Throughout history, pathogens have wiped out scores of humans. During the 20th century, there were three global-scale influenza outbreaks, the worst of which killed somewhere between 50 and 100 million people, or about 3 to 5 percent of the global population. The HIV virus, which went pandemic in the 1980s, has infected about 70 million people, killing 35 million. Several new viruses have since emerged, including SARS, MERS, Ebola, and most recently, Zika. There’s also the grim potential for someone to bioengineer a deadly pathogen in the lab. Advances in gene sequencing and gene-editing technologies are making such nightmare scenarios increasingly plausible. According to the Bill and Melinda Gates Foundation, this form of bioterrorism could wipe out 30 million people in less than a year. At the same time, our society is setting itself up for a global-scale disaster. Diseases, particularly those of tropical origin, are spreading faster than ever before, owing to more long-distance travel, urbanization, lack of sanitation, and ineffective mosquito control—not to mention global warming and the spread of tropical diseases outside of traditional equatorial confines. Accordingly, Oxford’s Global Priorities Project has listed a possible future pandemic as one of the worst catastrophic threats currently facing humanity. It’s difficult to know the exact form a viral pandemic would take, but for the sake of this exercise we’re going to assume it’s likely to be a disease similar to influenza. Unlike diseases that spread through bodily fluids or by mosquitoes, influenza is a respiratory disease spread through the air (e.g. coughing and sneezing). That makes it much more virulent, and far more dangerous. What’s more, we know it’s a strong flu that mutates easily, it’s deadly in some cases, it can spread before symptoms appear, and it’s is very capable of reaching pandemic levels of infection. It’s also a strain for which most people don’t have immunity or resistance. By any measure, the flu, whether it be a strain spawned from H5N1, H1N1, or H7N9, is a legitimate candidate for the next global-scale outbreak. Like any prepper worth their grain of salt, it’s important to have the right supplies on hand. The US Federal Emergency Management Agency (FEMA) recommends that you store a two week supply of water and food, but given that the first wave of a pandemic could last considerably longer than that (some outbreaks last years), it would be wise to stock up for at least four to six weeks, and longer if possible. Make sure you store non-perishable foods that don’t need to be refrigerated, prepared, or cooked. Have a 2-4 week supply of water in clean plastic containers. A good rule of thumb is to store a gallon of water per person per day, which would allow for both drinking, food preparation, and sanitation. Dr. Stephen Redd, the Director of the Office of Public Health Preparedness and Response (PHPR) at the Centers for Disease Control and Prevention (CDC), told Gizmodo it’s important to consider the season, and stock items like coats and blankets that will keep you warm. He also recommends buying a battery operated radio, along with a month’s supply of any prescription medicines you may be taking. According to epidemiologist Mark Smolinski, a Chief Medical Officer and Director of Global Health Threats at the US NGO Skoll Global Threats, you may want to consider stocking up on antiviral medications—drugs that can be used to treat flu illnesses, though he cautions that these drugs can become less effective over time. In addition to stocking up on prescription meds, FEMA recommends nonprescription drugs and other health supplies, including a standard first aid kit, pain relievers, stomach remedies, and cold medicines. FEMA says you should get copies of your health records from your doctor, hospital, pharmacy, and other sources and have them ready for personal reference. If you’re in the United States, Health and Human Services provides an online tool to help you do this. You should also get the latest seasonal vaccine. It may not protect you against the mutated strain, but then again, it just might. The CDC says you should plan for the possibility that usual services may be disrupted, including those provided by hospitals, banks, stores, post offices, and telephone and cell phone companies. ATMs will likely be shut down or out of money, so you should keep a small amount of cash on hand. Be prepared for disruptions to bus and subway services, along with possible fuel shortages, and stock up on supplies ahead of time. Families should also come up with a plan to take care of children who have to stay home from schools or daycare, as these places will likely be shut down during an outbreak. Both Smolinski and Redd say it’s a good idea to have face masks on hand to prevent the spread of diseases. A standard facemask will do, but an N95 respirator, which blocks upwards of 95 percent of small particles in the air, is better. If you’re going to wear an N95 mask, and you’re a guy, you may want to stock up on razors and shaving cream because it doesn’t work very well with facial hair. As for biohazard suits, that’s probably a bit much. It takes training and a strict adherence to protocol to use these suits properly, and most people won’t likely have the patience or know-how to use them during a crisis. Okay, so you’re all set for the pandemic. But what are you supposed to do when the outbreak strikes? “This is exactly what we work on at the CDC every day—preparing for an unpredictable event that could overwhelm the healthcare system,” Redd told Gizmodo. Redd explained that a common characteristic of epidemics is that misinformation runs rampant during the first few days, so be wary of information you receive during this time. “At the beginning of [any given] outbreak, many of the things we thought were true turn out not to be true,” he said. The next important thing to do, said Redd, is to learn the specifics of the disease or event and take the required actions to protect yourself. For example, if there was a large anthrax exposure—which isn’t communicable—you’d be wise to avoid the area where the exposure took place. And for diseases that are contagious, it’s a good idea to learn how it spreads, how to recognize its particular symptoms, and to avoid places where you’re likely to be exposed, such as schools, airports, and healthcare centers (if you can avoid them). Given the way viruses spread, particularly influenza, Redd proposed that schools and daycare centers would probably be shut down anyway. But even if individuals take precautions against the pandemic, there’s no guarantee that misinformation and fear won’t push communities into panic. In the event of a pandemic, it’s important to think about what we should do to avoid getting sick. But, as both Smolinski and Redd point out, we also need to think about what we should do in the event we are exposed or fall ill.
“Voluntary self-isolation is a very important intervention,” said Reed. According to CDC recommendations, family members who have an ill family member will likely be asked to voluntarily self-quarantine. “So that would mean, if my wife becomes ill, I would stay home and take care of her and not put others at risk when I might be incubating the disease,” Redd told Gizmodo. Essentially, you want to avoid becoming a so-called “superspreader.” Typically during epidemics, a surprisingly small minority of the population is responsible for infecting people. During the last Ebola outbreak, for example, a mere 3 percent of sick people were responsible for about 61 percent of all infections. Our advice: Do the right thing, don’t become a superspreader. On that point, there may be an overwhelming urge to stay inside for the long haul and dig in. But as Redd told us, barricading oneself and going into total isolation is probably overkill. Smolinski, a technical advisor for the 2011 film Contagion, isn’t so sure, saying it may be wise to hunker down and make your home secure. Regardless of your survival strategy, you should practice what the CDC calls “non-pharmaceutical interventions,” or NPIs. These are non-medical, common sense actions that you can take to help slow the spread of pandemic flu before a vaccine becomes available. In addition to staying away from sick people (and staying home if you become ill), FEMA recommends simple actions like washing your hands often and covering your mouth when you sneeze or cough. For communities, other NPIs can include the temporary closing of schools, making workplace sick-leave policies more flexible to allow workers to stay at home, and postponing or cancelling mass gatherings, such as sporting events, concerts, festivals. As a final note, Redd noted that severe influenza epidemics are infrequent, but we do have flu epidemics each winter. 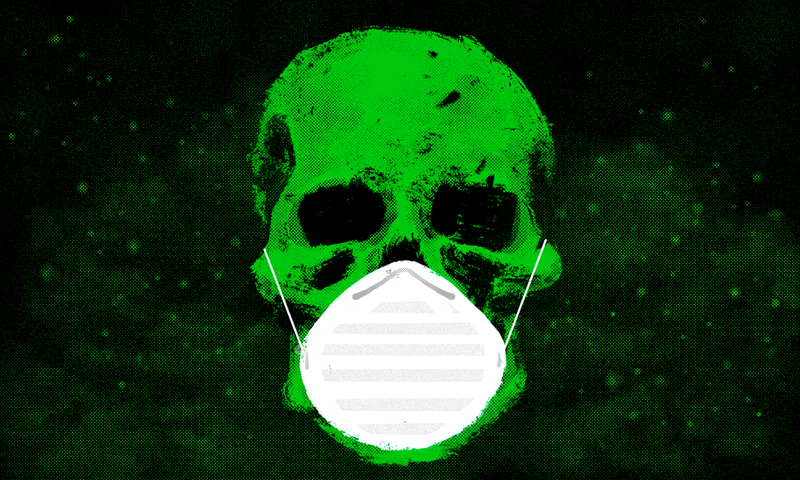 There’s no guarantee that these tips will help you survive a catastrophic pandemic, but they certainly won’t hurt. And who knows, you might just make it through—whatever that might look like. In the meantime, it’s important that we acknowledge the plausibility of a global-scale pandemic and plan accordingly. Otherwise, we’ll be caught completely off guard.